Next month, Oxford University Press will publish On Taqlid: Ibn al Qayyim’s Critique of Authority in Islamic Law by Abdul-Rahman Mustafa. The publisher’s description follows. Abdul-Rahman Mustafa offers a deft new translation of a large extract from the book I’lam al Muwaqqi’in ‘an Rabb al ‘Alamin, by the thirteenth-century Islamic scholar, Ibn Qayyim al Jawziyya. The I’lam comprises an extensive discussion of the subject of taqlid, or legal imitation. It is one of the most comprehensive treatments of Islamic legal theory and even today serves as a manual for lawyers, judges, and muftis. In the portion of the I’lam translated here, Ibn al-Qayyim introduces the nature of taqlid and divides it into several categories. He then provides an account of a debate between a critic of the view that taqlid of a particular school or scholar is a religious duty and this critic’s interlocutor. Among the topics discussed are the different kinds of taqlid, the differences between taqlid and ittiba’, the infallibility of religious scholars, the grounds on which one legal opinion might be preferred over another, and whether or not laymen can be expected to perform ijtihad. Ibn Qayyim’s legal theory is a formidable reformulation of traditionalist Hanbalism, a legal-theological tradition that has always maintained a distinctive character in Islamic history and that is now growing more influential due to modern interest in the Wahhabi movement and in Ibn Taymiyya, whose legal and theological thought was edited and refined by his student, Ibn Qayyim. 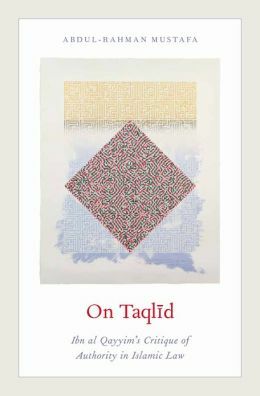 In his introduction to the translation, Mustafa critically reviews the scholarship on taqlid and outlines Ibn Qayyim’s legal theory and the importance of taqlid within it. Taqlid continues to generate controversy amongst educated Muslims and particularly academics, as Salafi interpretations of Islam, which are generally ‘anti-taqlid,’ come into conflict with the generally ‘pro-taqlid’ stance of traditional schools such as the Hanafis. Mustafa’s translation of a classic account of Islamic legal theory and strong critique of the dominant legal culture is a timely contribution to an increasingly heated debate.